Welcome to our first Crochet Tutorial Thursday Post! This week I thought I would start at the very beginning… so this is going to be review for many of you but I think it is a very good place to start. 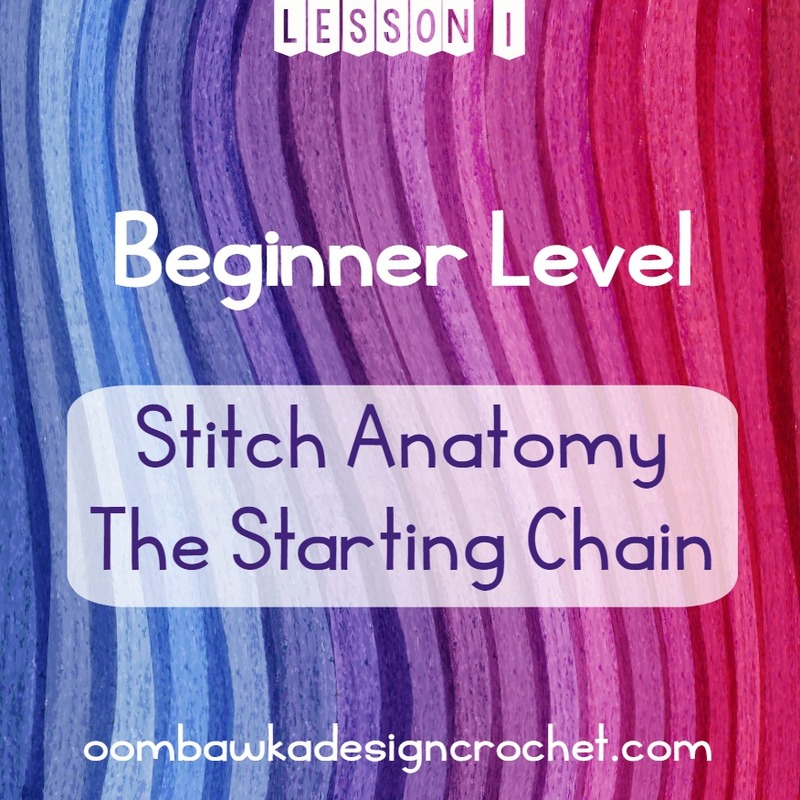 Beginner Crochet – Slip Knot and Starting Chain. Tips and tricks have been included in the tutorial for things like how you can tell if you have the yarn loop on the hook the right way (For example if it comes of the hook and you have to put it back on the hook – there is a right way and a wrong way to do this!) and how you can control the gauge / tension on the starting chain. There are 3 loops we can work into in the starting chain. I have indicated the three loops in the image above – the front loop (FL), back loop (BL) and the back bump. You cannot see the back bump unless you turn your starting chain over. Sometimes you will see the back bump abbreviated as (BB). The front loop in crochet is always the loop closest to you on the top of the stitch. This means when you get to the end of the row and you turn your project over to begin crocheting the next row, the front loop will still be the loop closest to you…the front loop is based on the crocheter’s position in relation to the project. The appearance of your starting chain edge (the bottom edge) will be different depending on which loop(s) you work into. 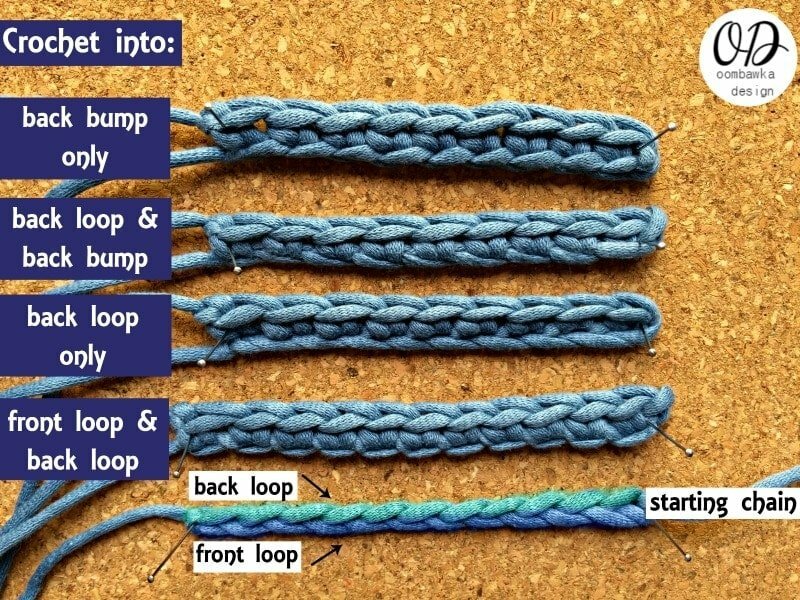 Here are some examples of the starting chain worked in different loops. Remember, to see the back bump you will need to turn your chain over. See the image at the top of the page to see where it is on the back of the chain. The first example (top) shows you how your project will look after you work into the back bump only of each chain across. This is my favorite option because the bottom edge and the top edge of the project mirror each other – you have the front and back loops on each edge. For projects where you do not want to add an edging (i.e. dishcloths) this will give you a nice finished appearance. The second example (2nd down) shows how your project will look after you work into the back loop and the back bump of each chain across. The third example (3rd down) shows you how your project will look after you work into the back loop only of each chain across. 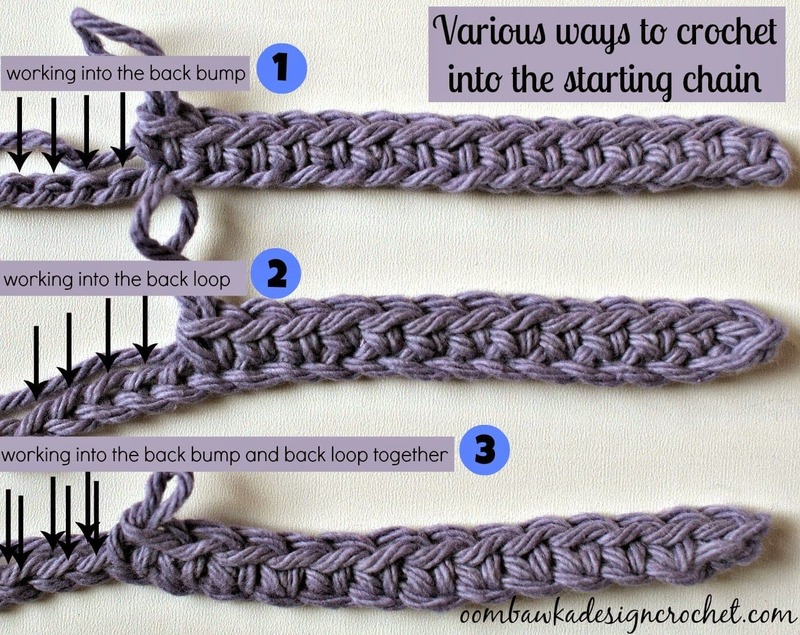 This is the method I learned when I was first learning how to crochet. The fourth example (4th down) shows you how your project will look after you work into the front loop and back loop of each chain across. For me this is the most difficult option to crochet – but it does give you a lovely crocheted edge and it is very strong. 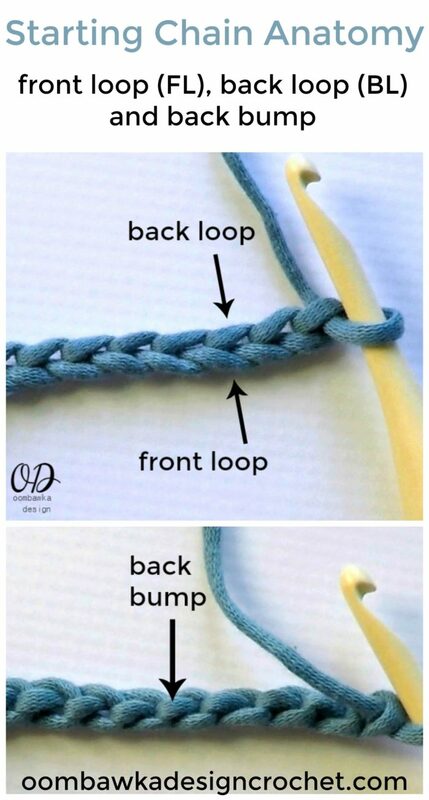 One reason you might want to choose the 2nd example (back loop and back bump) or the 4th example (back loop and front loop) is because it creates a sturdy foundation for your project. 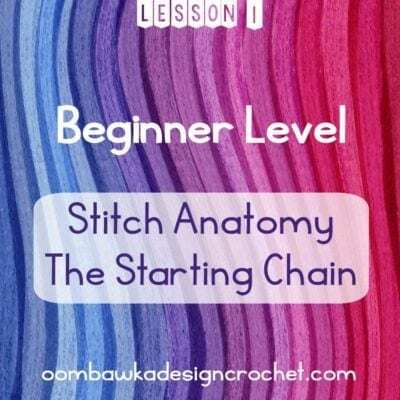 If you are working a project with shell stitches or clusters where you will be working a series of stitches in one chain, working under 2 loops of the chain can decrease the stretch of the remaining chain loop. Remember you cannot see the back bump from the front of the starting chain, it has to be twisted to show the back bump in image 1. Very welcome Janice 🙂 Happy to help! Thank you for these tutorials Rhondda. I really enjoyed them and they were very informative.